“It is with great sadness that I have decided to call time on my Dunlop MSA British Touring Car Championship career after seven consecutive seasons in Britain’s premier motor racing championship. “I can only feel pride in what I have achieved during my time in the BTCC, with eight podium finishes, including two race wins. Scoring BTC Norlin Racing’s first ever podium during the penultimate round of the season last year means I’m leaving things on a high. 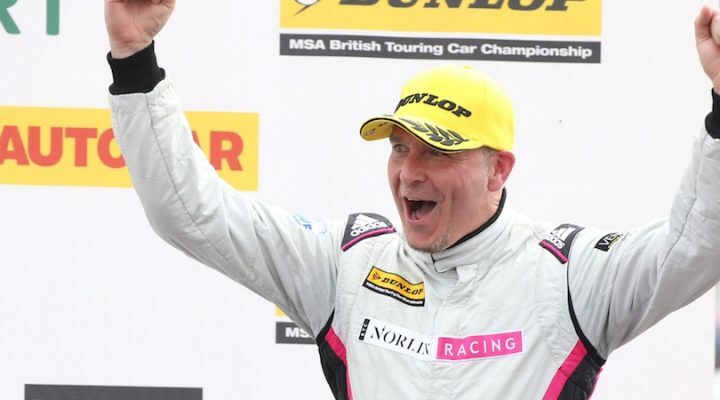 “I was almost ready to retire from BTCC at the end of 2016 when out of the blue I was handed a lifeline from Norlin. “We achieved some great results together last year and I have to say it was my most enjoyable season in the championship. “I hope I played my part in establishing the team and helping to make it one of the best in the paddock. I wish everyone involved success in the future. “My focus now turns to my son Callum’s racing career. He has performed very well during his first two seasons in karting and is now clearly ready to make the jump into car racing. I am looking forward to passing on my wisdom and who knows, the Newsham name may well be back in the TOCA paddock before too long. “I still love racing cars and have not turned my back on racing completely. Going forward, I may still drive the odd race if and when the opportunity comes along. “I would like to take this opportunity to thank my fabulous fanbase for their unbelievable support. I would also like to wish everyone competing this year a safe and enjoyable 2018 season.